Boost your water workout with the Aquatic Fitness Kit. The LAQFKIT comes with a power trio of toning tools, including aquatic resistance dumbbells, aquatic flotation belt and neoprene aquatic resistance gloves (medium). The Aquatic Resistance Dumbbells provide flotation and resistance in order to help build upper body strength. Engineered with EVA foam, these dumbbells are extremely lightweight and buoyant. They are also chlorine resistant and flexible, thanks to their closed cell construction. This aquatic fitness equipment features easy-to-hold, soft grips, making it ideal for long workouts. The Aquatic Flotation Belt provides excellent flotation to help maximize your full body workout routines. The adjustable belt and clip system accommodates various body types and makes for a secure, perfect fit every time. Constructed with ergonomically designed EVA foam, it is one of the most soft and comfortable aquatic flotation belts on the market. The Neoprene Aquatic Resistance Gloves are perfect for upper body aquatic resistance training. Constructed with neoprene, these gloves are durable and designed to retain body heat. They feature a wrist closure for easy adjustment and a rubber coated palm for a secure, non-slip grip. Webbed finger panels create better resistance, while exposed fingertips allow for better water feel. Outstanding, perfect, has driven me to excercise. Recent purchase was a replacement for a worn outTYR kit. It lasted about 3 years, and,it was time for a new one. I have always been into fitness, long distance running in my younger years. 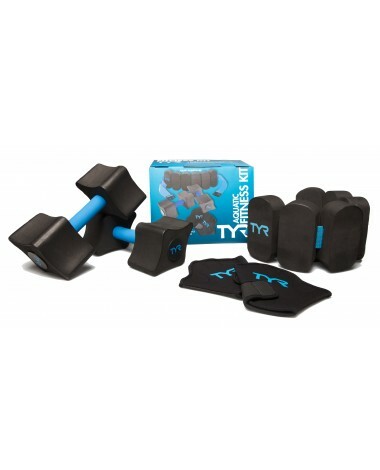 The tyr kit allows me to continue to work out, while preserving my joints. I am approaching 70, and my fitness routine includes yoga, walking and,water,jogging. Q: are the gloves sized? I have smaller hands. A: The Aquatic Fitness Kit gloves are neoprene aquatic resistance gloves and come in a size (medium). Q: What is the weight of dumbbells? A: Thank you for contacting TYR Sport! We are always eager to answer any questions you have about our products. Our Aquatic Fitness Kit comes with dumbells that weigh 0.2 pounds each. The dumbells provide flotation and resistance. A: Thank you for your inquiry. Yes our Aquatic Resistance belt can be purchased separately. We are working with our webmaster to get the style back on the website. It should be back up tomorrow. Thank you for notifying us. We will email you a PDF, of the complete directions for our Aquatic Fitness kit. Q: Is just the flotation belt available for sale? If so, what is its price? A: Thank you for your inquiry. The Aquatic Flotation Belt is available for sale on it's own, however we are currently sold out. We expect additional inventory on or about 06.19.15. and it retails for $19.99. Customer Service is our top priority. If you have any additional questions, or require additional assistance with sizing, please feel free to contact us via Live Chat or telephone (1-800-252-7878). We offer Live Support Mon-Fri 9AM-5PM PST.